When the user tap a table view cell, play a video in a new view. 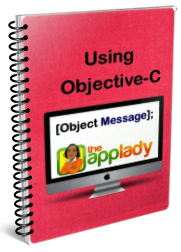 Now, this tutorial is a walk through of the construction of an iOS application that implement this requirement. At the end of the tutorial, it will look and function like the one shown in this QuickTime movie. I got to work by launching Xcode 7 on my Mac created a Single View Application project called AV Player. You should download it so you can follow along. Code presented on this page assume you are using Xcode 7.0 and Swift version 2.0. So if you are using a older or newer version of Swift, it may produce errors. Fix them by using Xcode’s Fix-it tool. Also, I assume you aren’t a newbie to the Swift Programming Language and you know your way around Xcode Integrated Development Editor. I created the project’s user interfaces by modifying the storyboard to look like Figure 1 below. Next, I connected the View Controller scene’s table view cell to the AV Player View Controller scene by creating a segue. Next, in the Attribute inspector, I set the segue’s Identity property. 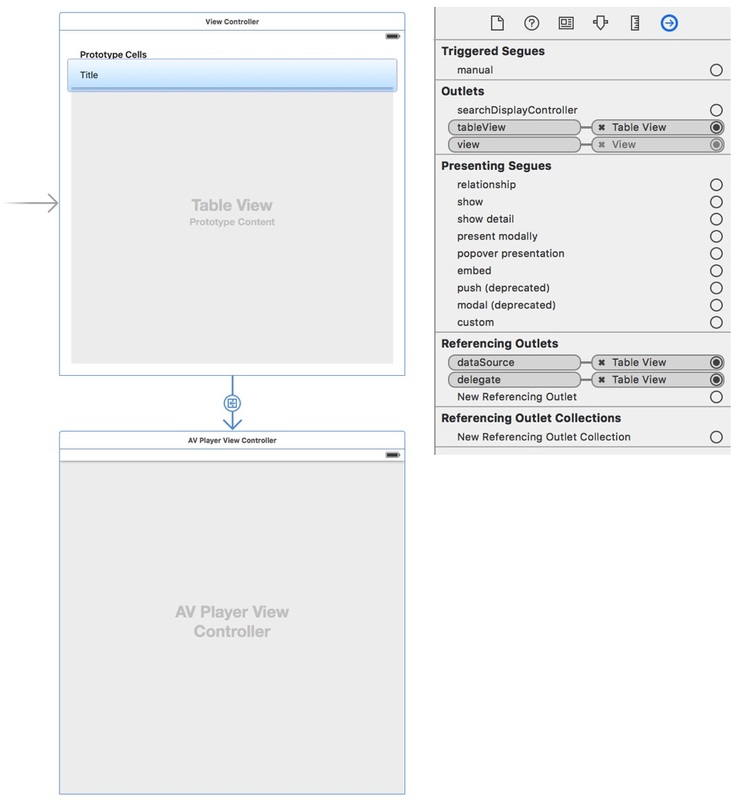 I performed other standard task in Interface Builder for the View Controller scene, as shown in the image below. Next, I selected the View Controller scene’s object and clear constraints and add missing constraints to it. I added a Cocoa Touch Class in the project with these options. Next, I configured the class so it contain only two string properties: title and url. 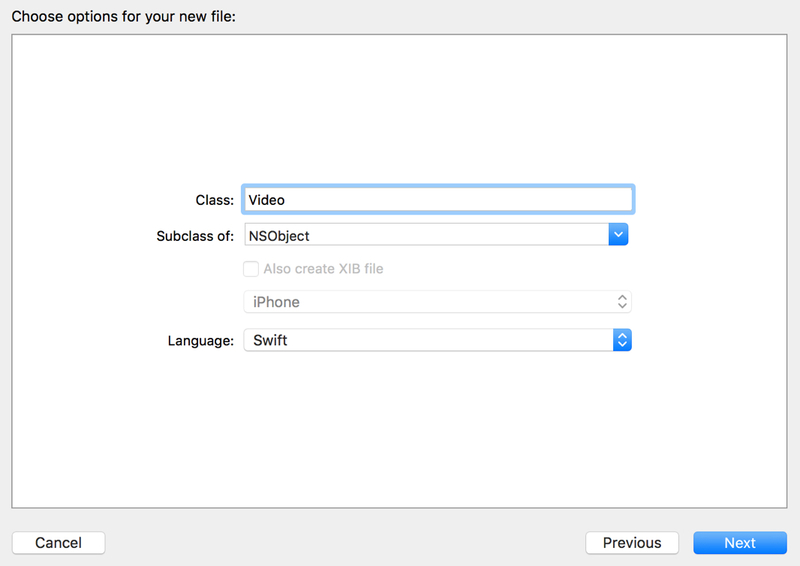 Now, the Video class is for creating video objects, in the ViewController.swift class. I entered code, in the ViewController.swift class file. It is the application’s workhorse. The code pretty much implemented tasks listed in the “App Response” section of these use case scenarios. The user launch the VideoViewer app on his device. The app create six video objects and display them in the View Controller’s table view cells. The user tap a cell on the Video List’s table view. The app initialize the AV Player by assigning it the selected video’s URL. 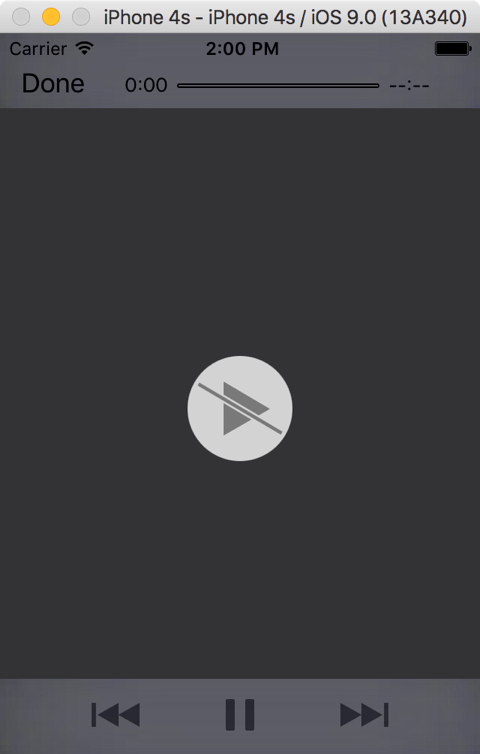 The app tell the AV Player to play the selected video, once it finish loading itself on the user’s device. The user tap the AV Player’s Done button. The app close the AV Player and display the View Controller’s view on the user’s device screen. Here is a break down of what the class code does. Above the class header, you’ll find these import statements. The second and third one is need for playing videos in the AV Player View Controller’s view. Below the class header, you’ll find three statements. The first one declared an array variable for holding video objects. In the viewDidLoad() function, the array was initialized with six video objects. Further more, the array is the table view’s dataSource. The second statement declared variable for holding the URL of the video the user select, in the View Controller’s table view. The third variable is for holding the name of the video the user select, in the View Controller’s table view. Code in the viewDidLoad() function created six video objects, set their title and url properties, then inserted them in the tableDataSource array. video1.title = "Big Buck Bunny movie trailer"
video3.title = "Cat vs Snake"
video4.title = "If I Were A Boy music video"
video5.title = "Beyonce Halo music video"
You pretty much know what the table view data source functions does. Now, code in the prepareForSegue() function pretty much initialize the AV Player View by assigning it the selected video’s URL; and tell the AV Player object to play the URL’s video, once the AV Player View Controller class finish launching its player view on the user’s device screen. let url = NSURL(string: video.url)! Now, when you run the AV Player app on your real device or the Simulator and tap a table view cell, the app will display the AV Player View Controller’s view; however, the selected video won’t play. “App Transport Security is a feature that requires secure connections between an app and web services. The default connection requirements conform to the best practices for secure connections. To solve the App Transport Security issue, you will have to disable it by setting a couple of keys in the AV Player app’s Info.plist file. In your app target, click on “Info” at the top, then right-click on the list and select “Add Row”. 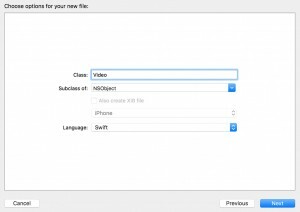 In the row that appears, type “NSAppTransportSecurity”, and change the type to “Dictionary”. Expand that new “NSAppTransportSecurity” key (arrow next to name should point down), right-click that key and select “Add Row”. A new row should be a child of the “NSAppTransportSecurity” key. Name that new child row “NSAllowsArbitraryLoads”; set the type to “Boolean”, and set it’s value to “YES”. Save the Info.plist, clean (shift + ⌘ + K), build (⌘ + B), and run (⌘ + R) the app again on your real device or the Simulator. When you tap the table view cell, the video is loaded in the AV Player View Controller’s view and start playing. By the way, on the iPad Air and iPad Air 2, the user have the option to play one video in a full size AV Player and another one in a small AV Player. The user can drag the small video player’s screen to one of four corners of the larger player’s screen, while the video is play or in pause mode. Take a look at the QuickTime movie presented at the beginning of this tutorial, to see what I mean. I need a code when I tapped in collection view cell to play a video. Do you know how to implement that? this can be applied to collection view? plz send this code video tutorial…………………. I want exactly this type of video player but it is in swift i want in objective c .. This is an excellent tutorial! Thank you for taking the time to post! 1) In this display video at the beginning of the article, you demo picture in a picture capabilities. I do not see where this functionality is in the code given in the article or even when downloading/running a build of the AV Player Project. How would you write that into the ViewController.swift? 2) I am working from a table view controller (not the initial controller) that has a navigation controller/bar feeding through it. When I click a cell in the table view, how would I launch the AV Player without the navigation bar displaying? Thank You Jordan for your comment. There’s no code for picture in a picture capabilities. It is a built-in feature that work only on iPad devices. The AV Player app is running on the iPad Air device in the demo video shown at the beginning of the article. I don’t understand your second question. All I can say is that when you tap a cell in a regular tableView or a tableViewController’s tableView, the AV PlayerController’s view take over the current view; so you wouldn’t see a navigation bar. That completely makes sense then! With regards to the second question, I had used a ‘Show’ segue. It was displaying navigation bar inside of my AV Player View and covering up my ‘Done’ button, timespans and full screen button. I changed the segue to ‘Show Detail’ and the navigation bar disappeared inside of the video player. Yes… I did kick myself a little over that one. Haha. Thank you for the quick response!!! This was a great tutorial and please keep up the good work!! I’m glad you figured out the answer to the second question.